The chassis is composed of an extruded aluminium body closed off with panels on the front and rear. To open it, first remove the volume knob. It is held in place only by friction, so you just need to pull on it. Then, to open the chassis, you need two screwdrivers : Torx T5 and Torx T6. The 6 screws, two a the front and four at the back, are clearly visible and accessible. At that point, you can slide the PCB out of the enclosure. The face plate will still be attached to the potentiometer with a nut. Unscrew the nut to remove the face plate. The circuit is quite simple. It can be divided in two main parts. 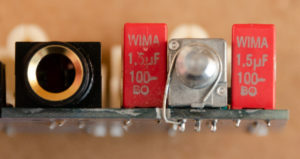 The first is the power supply highlighted in green in the photo above. 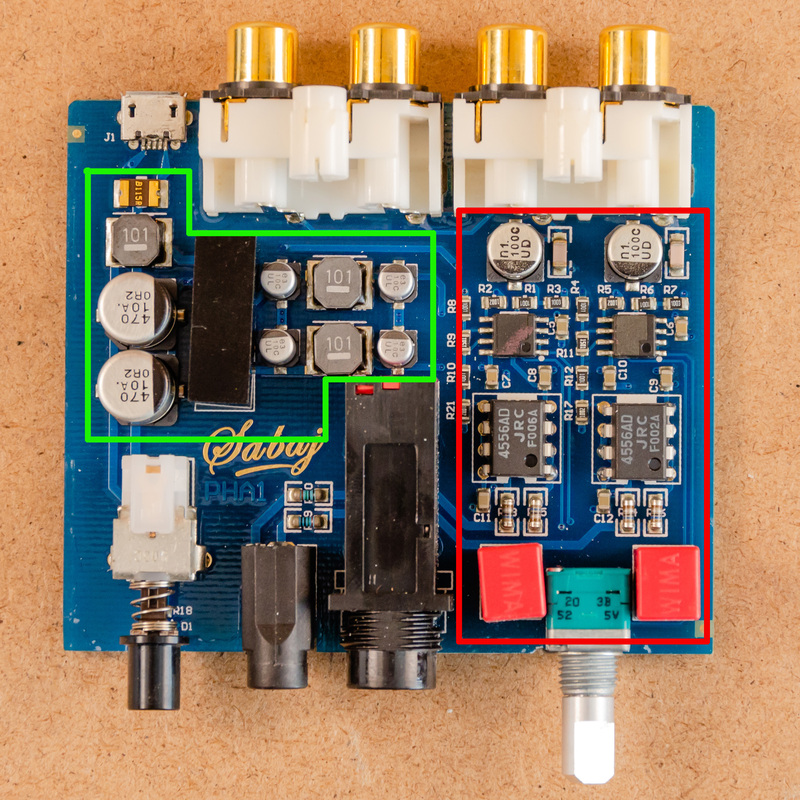 Then, the audio “processing” on the right of the PCB, highlighted in red. The power supply converts the 5VDC from the USB port to two power rails : +15VDC and -15VDC. It is probably a switched-mode power supply, since there are inductors. This kind of power-supply is very efficient, but tends to be quite noisy. Sabaj seems to have properly implemented it because I have never heard any electrical noise while using the amplifier. 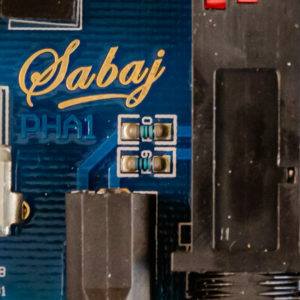 The black plastic component in the middle of the power supply is branded “Sabaj”, so I could not get more information about the chip controlling the power supply. The audio amplifying circuit is composed of two identical sub-circuits, as highlighted in red in the previous figure. Each sub-circuit handles one audio channel (left/right). There are two chips per channel. The bottom one (DIP package) is a JRC NJM4556A, a dual high current operational amplifier. The other chip (SOIC package) is not labeled, but by reverse engineering the circuit, I’m pretty sure it is also a dual op-amp chip. Initially, I didn’t understand why the circuit used two NJM4556A, since a single one has two op-amps, one for each channel. By tracing the circuit of a channel, I was able to understand why. The above figure presents the circuit of a single channel. The signal first goes through a buffer op-amp. This is used to prevent loading the signal source. This op-amp is located in the unlabeled chip. Then, the signal goes to the volume potentiometer. The signal is brought back to the unlabeled chip to amplify the signal in its second op-amp. The gain of this amplification stage is 2.5 (1+1.5/1). Finally, the signal goes to the NJM4556A. What is interesting is the two op-amps on the chip are used in parallel and each is in a follower configuration. The two are in parallel to drive more current to the headphones. So, the second op-amp is used to increase the signal voltage and drives almost no current. Then the two NJM4556A are used to deliver the necessary current to the headphones to keep the voltage set by the previous stage. 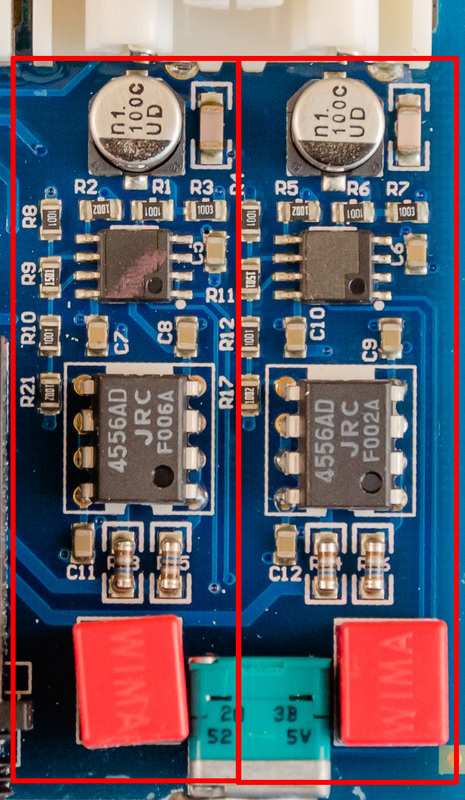 A single op-amp in the NJM4556A probably could not deliver enough current to reach the desired current wanted by the designers. 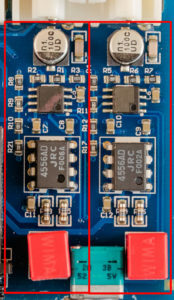 This explains why there are two NJM4556A chips on the board. After leaving the NJM4556A, the signal goes straight to the 1/4″ jack. To drive the 3.5mm jack, a 150 ohm resistor is added in series of each channel as can be seen in the picture below. This is used to reduce the signal delivered to the headphones plugged in the 3.5mm jack. The theory is that low impedance headphones generally use 3.5mm jacks, while high impedance headphones use 1/4″ jacks. By adding the 150 ohm resistors, low impedance headphones in the 3.5mm jack should have an equivalent volume to high impedance headphones plugged in the 1/4″ jack. I tried both jacks with my Sennheiser HD555 headphones which have a relatively low impedance of 50 ohm. They sound great in the 1/4″ jack, but the volume is too loud and I had to build a stereo attenuator to reduce the volume. In the 3.5mm jack, they sound “muted”, not very good. The overall build quality of the amplifier is very good. The chassis is all metal (aluminium?) and is very solid. Even the volume knob is metal. Also, the power button is spring loaded and has a satisfying tactile feedback. The icing on the cake is a power LED that isn’t too powerful. It is blue, which I don’t like, but since it doesn’t light up a whole room when it on, it OK. 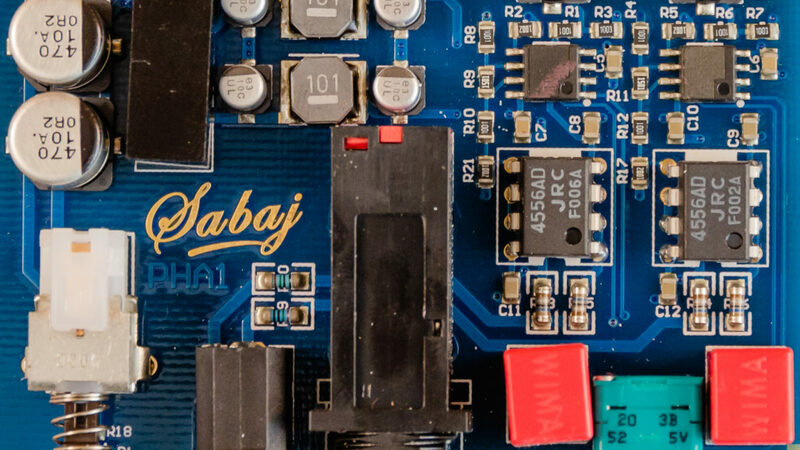 The PCB layout is good and there are no bad surprises in the assembly. The only dubious assembly element is a solid bare wire soldered to ground and wrapped around the threads of the volume potentiometer. 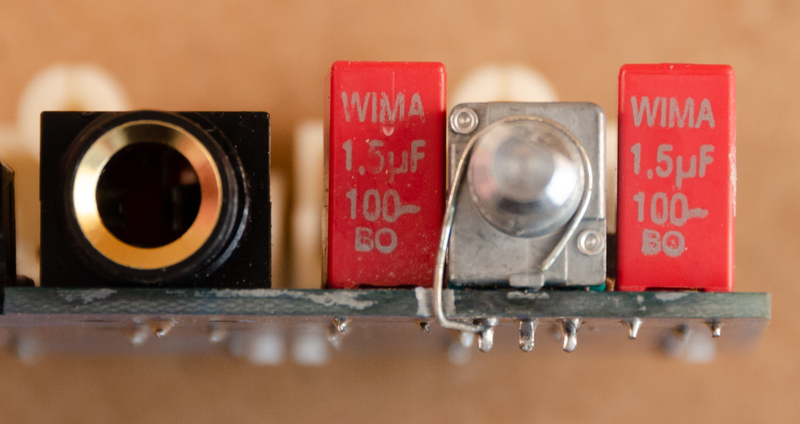 Ground wire around the volume potentiometer. This wire is probably used to make a good electrical contact with the face plate to ground it. They even sanded the area around the potentiometer hole on the backside of the front panel to make sure the ground wire makes good electrical contact with the face plate. This is not a problem, but the way it is implemented shows it wasn’t planned and they had to fix it during production. 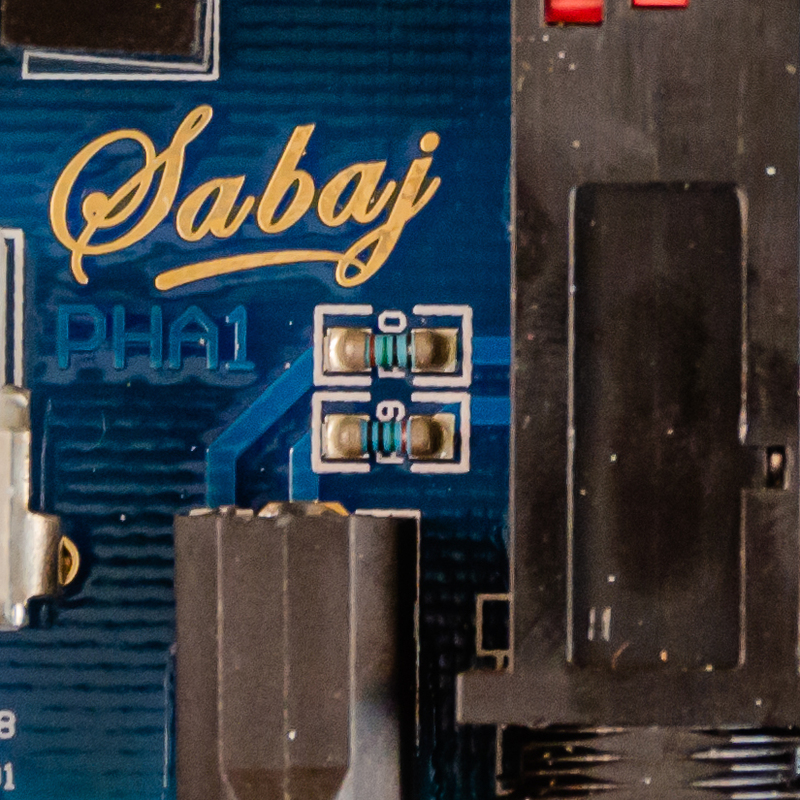 With all that said, it is unfortunate that Sabaj seems to have discontinued the PHA1. The only headphone amplifier from Sabaj I could find as of May 2018 is the “upgraded” PHA2. The specifications of the PHA2 are better (more power, less distortion, etc. ), but it is much more expensive. When I bought the PHA1, I was looking for an inexpensive headphone amplifier to control the volume of my Sennheiser HD555 at my desk and the Sabaj PHA1 fit the bill perfectly.